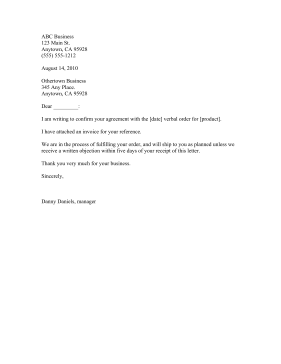 Cover your bases by following up a verbal order with this formal letter confirming that the order was made and shipment is in progress. Ideal for attaching to invoices. I am writing to confirm your agreement with the [date] verbal order for [product]. I have attached an invoice for your reference. We are in the process of fulfilling your order, and will ship to you as planned unless we receive a written objection within five days of your receipt of this letter.